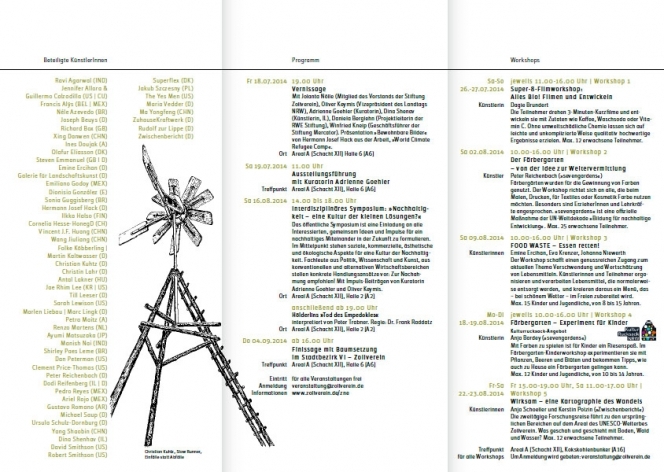 The exhibition at Zollverein Schacht XII, hall 6 and hall 8, is accompanied by a free side programme including workshops for adults, children and infants and an interdisciplinary symposium on August 16th, 2014. The side programme was developed in collaboration with RWE Stiftung and Stiftung Zollverein. Workshop 1 Super-8-Filmworkshop: Everything bio! Workshop 3 FOOD WASTE – save Essen! Participation at the symposium and all workshops is free.